F Ryan Kinasewich (Medicine Hat, Tri-City, 1998-2004) signed a contract for the rest of this season with Dornbirn (Austria, Erste Bank Liga). Last season, with the Graz 99ers (Austria, Erste Bank Liga), he had 13 goals and 11 assists in 28 games. 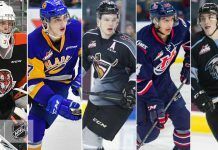 ROOT Sports has announced its eight-game TV schedule that features Friday night WHL games that include U.S. The schedule opens Jan. 16 with the Tri-City Americans in Vancouver to face the Giants. Once again, Ian Furness will handle the play-by-play with analysis from former D Kevin Sawyer. Jan. 16 — Tri-City at Vancouver, 7:30 p.m.
Jan. 23 — Everett at Kelowna – 7:05 p.m.
Feb. 6 — Portland at Seattle – 7:35 p.m.
Feb. 20 — Tri-City at Everett – 7:35 p.m.
Feb. 27 — Spokane at Tri-City, 7:05 p.m.
March 6 — Seattle at Portland, 7 p.m.
March 13 — Portland at Spokane, 7:05 p.m.
March 20 — Everett at Victoria, 7:05 p.m.
A scheduled game that was to have had the Medicine Hat Tigers in Victoria to play the Royals was postponed until tonight. The Tigers had problems getting through the Interior of B.C., due to highway closures for avalanche control. . . . The highway opened late Wednesday morning and the Tigers were able to catch an evening ferry to Victoria. In Prince Albert, G Rylan Parenteau stopped 44 shots to lead the Raiders to a 5-1 victory over the Moose Jaw Warriors. . . . F Tim Vanstone scored twice for the Raiders, giving him five this season. 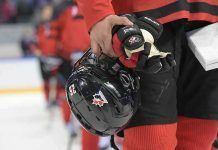 He opened the scoring with a shorthanded goal at 12:58 of the first period. . . . F Brayden Point, who played for Canada at the WJC, returned to the Warriors’ lineup. He drew an assist on F Jack Rodewald’s 20th goal of the season, running his point streak to 13 games. . . . The Warriors scratched D Connor Clouston and F Axel Blomqvist, both of whom were acquired in trades this week. . . . D Dalton Yorke and F Kris Schmidli, acquired by the Raiders from Kelowna in the deal for F Leon Draisaitl, both played. . . . The Raiders(17-23-1) snapped a five-game losing skid and closed to within a point of the Warriors, who are fourth in the East Division. . . . Moose Jaw (16-22-4) has lost two in a row. . . . In Swift Current, D Max Lajoie scored the only goal of a five-round shootout to give the Broncos a 5-4 victory over the Calgary Hitmen. . . . Broncos F Jake DeBrusk forced OT with a PP goal at 19:11 of the third period. He scored twice, giving him 22. . . . The Hitmen held leads of 2-0 and 3-1 but found themselves tied 3-3 after Broncos F Colby Cave got his 19th goal at 8:56 of the third. . . . Calgary F Connor Rankin gave the Hitmen a 4-3 lead with his 20th goal at 9:23. . . . Lajoie had three assists, all in the third period. . . . F Adam Tambellini and D Travis Sanheim each had two assists for Calgary. . . . Broncos G Landon Bow stopped 43 shots, six more than Calgary’s Mack Shields. . . . The Broncos lost F Coda Gordon to an undisclosed injury in the first period. . . . G Brendan Burke, acquired Tuesday from the Portland Winterhawks, was on Calgary’s bench backing up Shields. . . . The Hitmen were without F Taylor Sanheim, who drew a two-game suspension for a headshot major and game misconduct he incurred Tuesday night in Moose Jaw. . . . The Broncos (20-17-4) had lost their previous two games. . . . The Hitmen (22-15-4) had won two straight. The loser point lifted them into second in the Central Division, a point ahead of the Red Deer Rebels. . . . In Regina, G Tyler Brown stopped 25 shots to help the Pats to a 3-1 victory over the Everett Silvertips. . . . F Braden Christoffer, in his first game as the Pats’ captain, opened the scoring on the PP at 10:29 of the first period. . . . He’s got 14 goals. . . . Everett F Nikita Scherbak tied it, with his 19th goal, at 13:05. . . . Regina F Pavel Padakin broke the tie with his 10th goal at 16:54 of the second. . . . Pats F Jesse Gabrielle added insurance with his 14th goal at 13:18 of the third. . . . The Pats scratched G Daniel Wapple (groin), so G Tyler Fuhr of the SJHL’s Estevan Bruins was on the bench. . . . F Taylor Cooper and D Connor Hobbs, acquired in deals this week, were in Regina’s lineup. . . . Everett G Austin Lotz stopped 32 shots. . . . Regina (25-12-3) is 5-0-1 in its last six. . . . Everett (24-12-4) had won its last three games, all on an East Division swing. . . . In Prince George, G Evan Sarthou turned aside 33 shots to lead the Tri-City Americans to a 5-3 victory over the Cougars. . . . Americans’ F Justin Gutierrez broke a 1-1 tie with his sixth goal, on a PP, at 16:38 of the second period. . . . F Nolan Yaremko, one of three affiliate players in Tri-City’s lineup, scored his first goal at 9:27 of the third period for a 4-2 lead. . . . Cougars F Brad Morrison got his 15th goal at 14:12, on a PP, but Americans F Richard Nejezchleb iced it with his 11th goal, an empty-netter, at 19:52. . . . F Chase Witala had three assists for the Cougars. . . . The Americans (19-19-2) snapped a four-game losing skid. They are fifth in the U.S. Division, two points behind the Seattle Thunderbirds. . . . The Cougars slipped to 20-22-0. . . . In Spokane, F Devon McAndrews scored his first two goals to help the Chiefs to a 4-1 victory over the Portland Winterhawks. . . . McAndrews broke a 1-1 tie at 9:13 of the second period and added insurance at 1:50 of the third. . . . Portland F Oliver Bjorkstrand, in his first game since playing for Denmark at the WJC, got his 22nd goal at 14:07 of the first period. . . . Spokane scored the game’s last four goals. . . . Spokane F Kailer Yamamoto had two assists. . . . Chiefs F Adam Helewka scored his 21st goal into an empty net at 18:32 of the third. . . . Spokane D Jason Fram counted his eighth goal and added an assist. . . . Spokane G Garret Hughson stopped 38 shots, six fewer than Portland’s Adin Hill. . . . Hill, who had put up back-to-back shutouts, had his shutout string end at 174:38. According to Todd Vrooman, the Winterhawks’ play-by-play voice, that is just 1 minute 16 seconds shy of Brendan Burke’s franchise record. . . . F Nic Petan, who played for Canada at the WJC, wasn’t in Portland’s lineup, but Danish F Oliver Bjorkstrand was back. . . . D Adam Henry, acquired Tuesday from Saskatoon, made his debut with Portland. . . . The Chiefs (22-14-3) had lost their previous two games. They are second in the U.S. Division, two points ahead of Portland. . . . The Winterhawks (21-18-3) had won their previous two games. . . . In Kelowna, F Leon Draisaitl scored a goal and added an assist in the second period as the Rockets beat the Vancouver Giants, 4-2. . . . Draisaitl, who was acquired from the Prince Albert Raiders on Tuesday, was playing his first game after being returned to the WHL by the NHL’s Edmonton Oilers. . . . Draisaitl drew an assist on a PP score by F Gage Quinney that broke a 1-1 tie at 1:13 of the second period. . . . Draisaitl scored the Rockets’ third goal at 5:00 of the second. . . . F Jakob Stukel scored his third goal of the season at 12;44 of the third to get the Giants to within one. . . . Kelowna F Rourke Chartier got his WHL-leading 36th goal into an empty net at 19:00. . . . F Dillon Dube drew two assists for Kelowna. . . . Rockets G Jackson Whistle stopped 39 shots, 10 more than Vancouver’s Cody Porter. . . . The Rockets (32-6-3) have won three in a row. . . . Vancouver (18-20-2) was 2-0-1 in its previous three games.